When I saw first minutes of the movie I smiled saying ‚oh wow, film about ZUS*’, but I didn’t really believe that the ZUS part will be that big. Soon I found out that I was right and wrong at the same time. This movie is something more than a story of a guy who doesn’t want to be broken by institution. It’s also about the guy who is just good person with warm, honest heart. And about a woman, who has bad luck and many troubles and tries to handle the best way she can. And about the fact that good people are going to spread the good no matter what. Of course it’s gonna sound like a biggest cliché but I have to say that, the film consists of many Kafkaesque elements. Institutions are often Kafkaesque. Think about that. Daniel ismore or less 5o year old guy after severe heart attack. His doctor strongly forbids him to work, but the fact that he can walk 50 meters and take something out from the pocket disqualify him in the eyes of insurance company. He lacks sufficient points from silly questions which disqualifies him in the eyes of The Institution. As there are strict procedures, he can’t appeal as long as he doesn’t receive a phone call confirming the letter he got. Going to The Institution himself makes him even more frustrated. Daniel tries to make his way in the reality of absurd in which he is forced to seek for a job he can’t really do, just to have any kind of allowance. He is forced to use computer which he can’t use, he is struggling with office workers who have to follow strict rules that don’t match reality. Our protagonist has to be fighter, but he doesn’t want to be one. He just wants to be treated fair and with respect as he is honest for others. It’s just one of the aspects of the movie, I’m not even sure that it’s the most important, but in his story I see my story (these months without any income!) and people I know from internet. It’s hard to express. 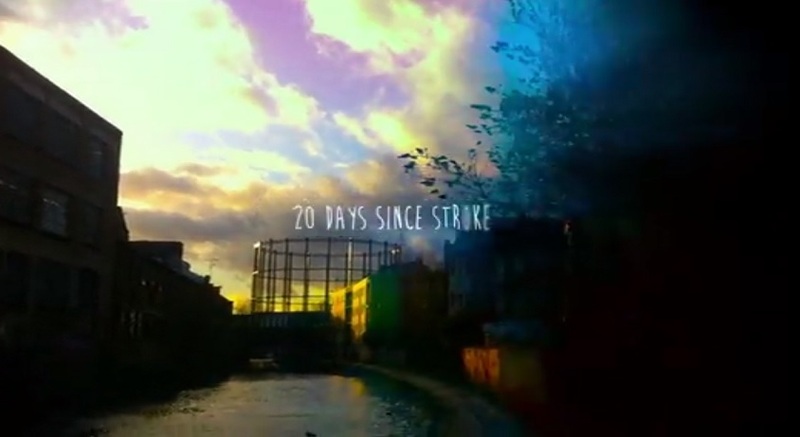 The movie triggered the discussion in the UK, many people say that they know this theme from their experience, others can see the cruelty of bureaucracy for the first time. In my opinion the picture in the movie is milder than in reality. It doesn’t depicts well the constant fear which accompanies people who struggle for living while being sick. Fear is our companion. Fear of second (third in my case) stroke, another heart attack, financial security, fear of evil commission… I couldn’t sleep at nights when I was waiting for my commission. I knew that I’m not able to work. What should say my friend with multiple sclerosis and after stroke which found out that commission thinks that she is able to work in an office? 😮 I believe her that she can’t. and i really think that her commission was heartless. She is like Daniel Blake (and me) – doesn’t want benefits for life. She wants to go back to job, but it’s impossible now. And there is a fear. what should say my another friend who after another stroke is more and more disoriented and can do simply less things? She can’t sleep at nights either. Every commission in Institutions which should be here to help is so stressful for her, because she was mistreated, misdiagnosed many times, she was also badly treated by members of commissions. She can fight but I see her loosing faith. Sadly you can’t buy faith. In every second message from her I see these words. „I’m afraid”. This reality is so difficult for most of people in need, but especially for these with cognitive problems. I guess I should feel lucky as I was in hospital after second stroke at a date of my complementary commission. First one couldn’t decide. Able to work or not able? Well, my second stroke helped them judge. 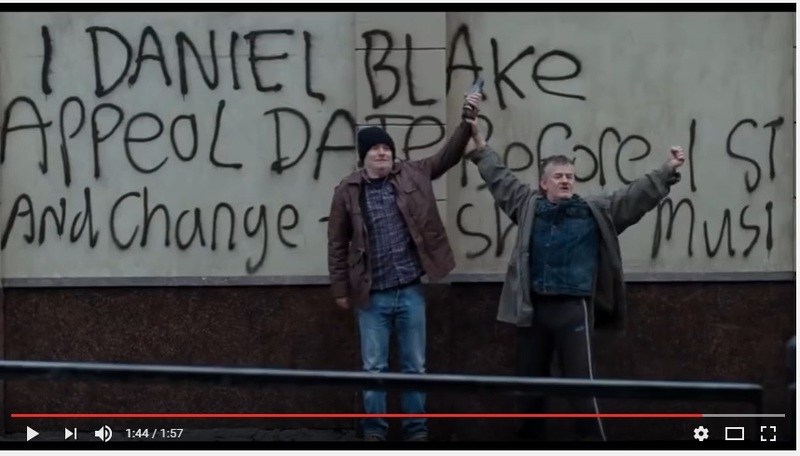 Daniel Blake is true not only for Great Britain. Details may vary, but will be true for all countries in which a person is a number in the system. It’s also s true emotionally. It took away something like 3 liters of my tears. ‚d) don’t want to feel alone with their problems. there is also moving, not less important!, Katie’s story. It’s also important. the friendship is important, everything about this movie is important.